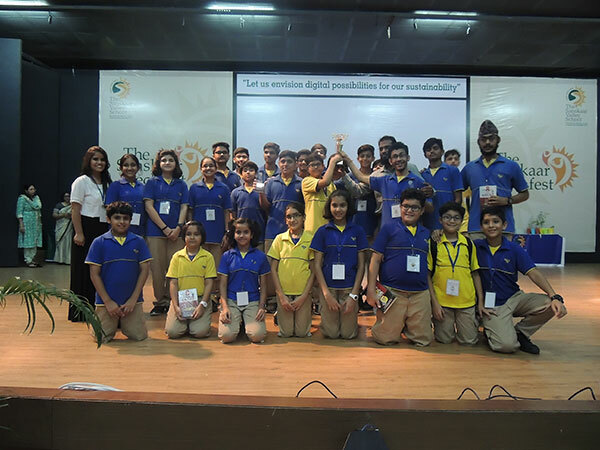 Billabong High, the Overall Champions of The Sanskaar Techfest brought home the Champions trophy after competing with 16 schools of the city. The brilliant team that made this possible comprised students from grades 3 to 12. 1. 3D Picasa - Diya Chhabria- 3rd position. 2. Weave The Web- Sahanj Jose 9A and Prakhar Singh 9A - 2nd position. 3. Innovation Zone -Guneet Singh Bagga 9A and Sameer Khan 12A - 2nd position. 4. Movie Mania - Akshat Navlani 7B, Vaibhav Lachhwani 7A and Piyush Tiwari 7B- 1st position. 5. Movie Mania -Yash Jain 11A, Jayesh Rajani 9 and Aryaman Shukla 9- 1st position. 6. Cin and Cout - Abdul Manaf 11A and Shivang Agrawal 12B- 2nd position. 7. Mission Gamify - Vaibhav Himthani 11A, Arpit Sharma 11A,Yuvraj Maroo 11A,Shantanu Rastogi 12A and Aman Dangi 12B- 1st position. 8. Clevernote - Kunal Chandiramani 9A- 1st position.